Welcome to Family Tides in Seaside, located in, you guessed it, Seaside! This one story home with 1,700 square feet is perfect for you and six guests, with three bedrooms and two baths! Located within close walking distance of the beach, you and your family and friends will love the cozy and nautical themes this vacation home has to offer! Step right in and you'll be greeted by deep sea blues and gorgeous wood flooring and furniture! Cozy and quaint, you'll feel right at home in this beautifully decorated home! With plenty of space to relax around the TV and seats at the dining room table, the whole family can choose to be together or apart, whichever they'd like! Head over to the patio doors, where you can find a small deck to relax on. There is also extra seating in this area, right off of the kitchen! 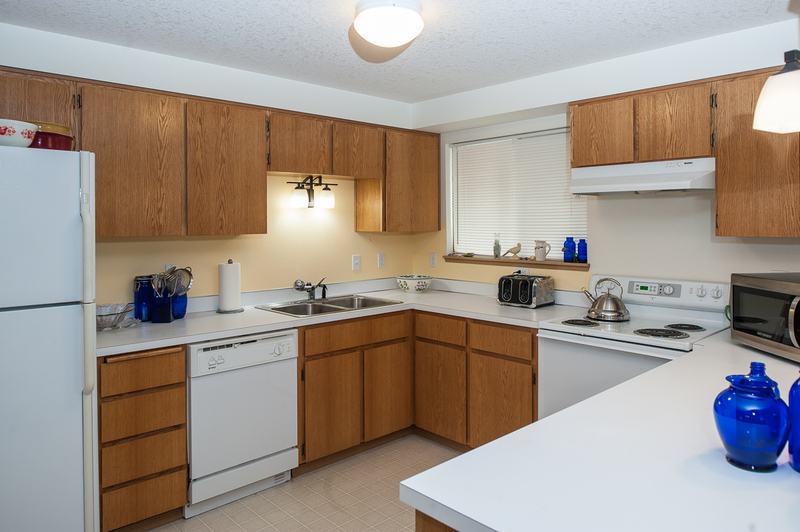 The kitchen is fully functional, with everything you'll need to enjoy your stay! Make a homemade meal every night, or store some small necessities for breakfast or snacks! Head over the first bedroom and you'll find a nicely decorated room perfect for the kids, with two twin beds. The second bedroom offers two full size beds, perfect for couples or older kids who need more space. The final bedroom, the master, is beautifully decorated in blues to match the sea, with a private bathroom. Each bathroom comes with a shower and tub combo. 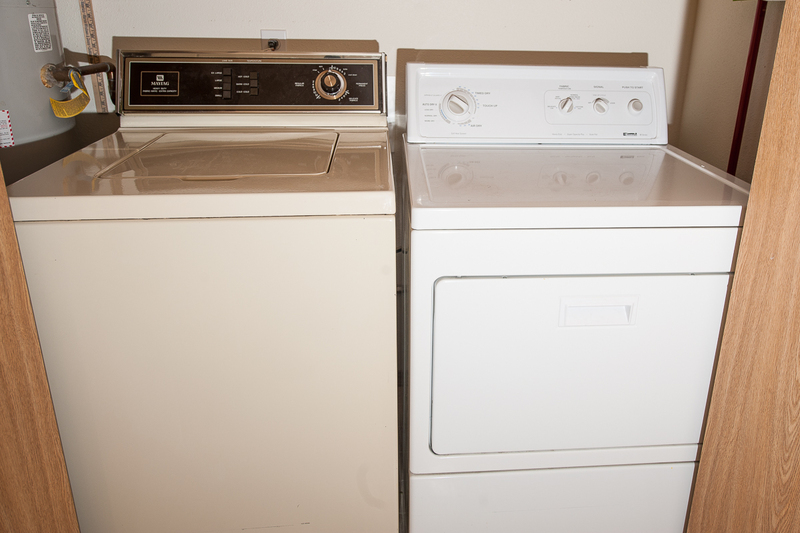 You'll also find a washer and dryer at this vacation rental, so feel free to pack a little lighter, knowing you'll be able to wash clothes while staying here! Head outdoors and you'll find a barbecue for you and your guests to enjoy during the summer. Book your stay at Family Tides in Seaside today with Oregon Beach Vacations! BEACH ACCESS: Access is approximately 1.5 blocks away, west of the home. "We were very happy with our rental. We were 4 adults and 1 child. House was plenty big for us. It was stocked with what we needed. The location was good. It is just minutes to the beach, Prom or Broadway, the hub of activities, shopping and eating. I would have to be nit picking to find fault with this house. We visit Seaside several times every summer and have stayed at many a house. Some were very old, not up to date or had small bedrooms. Some were brand spanking new. This house falls in the middle and hits the sweet spot in value, location and the house itself. I also like the fact that I wasn't asked to start any loads of laundry [towels and sheets] before I checked out, like at other rental properties. In short.....Excellent rental. You can't go wrong." "Hello Robert, Thank you for your review. We are glad to see that you and your family had a wonderful visit to Family Tides in Seaside! We do not ask that our guests wash their linens because we do all of our laundry off site. Thank you for your review, and we hope to have you stay with us again in the near future!" Clean. Well equipped. Lots of space. Great location. "We really enjoyed our stay. The garbage cans blew over in the wind before we arrived, with the weather on the Oregon coast this must happen often, consider a fence around them, for curb appeal. Also, the home has great furniture pieces, but the layout needs help, the flow was unsettling to the two designers in our group!" "Hello Sandra, Thank you for your review. We are glad to see that you and your group enjoyed your time spent at Family Tides in Seaside. Thank you for your suggestions as well. We will take them into consideration. Thank you again for your review." "Very roomy, clean and comfy! I’d highly recommend renting! This was perfect for our two night stay! Thank you for sharing. I walked to the beach each morning taking in the fresh air and saying my prayers!! Thank you again for a beautiful stay!" "Hello Andrea, Thank you for your review. We are happy to hear that you had a great stay at Family Tides in Seaside. We hope this means that you'll be staying with us again in the future." "A perfect house for our six-girls summer vacation. Very clean and contemporary, stocked with games and entertainment. Cozy bedrooms and living areas and a big well-appointed kitchen for cooking group meals, plus the back patio was great for afternoon hangout and bbq. Quiet location less than a five minute stroll to the sand, which we had practically to ourselves on this north end of the beach. Management was easy to work with. We can't wait to return next year! " "Hello Robyn, Thank you for your review. We are glad to hear that you enjoyed your stay at Family Tides in Seaside. We are happy that the home suited your every need perfectly! We look forward to having you stay with us again soon!" "Rental was spacious, well kept, had amenities and close to beach. Great rental for the first time. Further from main strip which is great. Once you hit the sandy beach there is still a bit of a walk to the actual beach but well worth it with location." "Hello Elena, Thank you for your review. We are glad to hear that you enjoyed your stay at Family Tides in Seaside. It sounds like this rental had everything you were looking for to enjoy your time at the beach. We hope to have you stay with us again in the future." "It was clean all necessary supplies were provided. Price was a little high since it was not in front of the beach but it's a nice walk to the ocean. Overall nice, clean and fun"
"Hello Veronica, Thank you for your review. We are glad to see that you enjoyed your overall stay at Family Tides in Seaside. We hope to have you stay with us again soon on the Oregon coast." "House and furnishings are in great shape. Kitchen is a little dated but had all the necessary amenities. The house is located on a dead end street so the location is quiet. The house is about 1 block from the beach entrance, then a longer walk through the sand dunes to get to the actual beach. Really liked the house - would definitely stay there again if back in Seaside. " "Hello Linda, Thank you for your review. We are glad to see that you enjoyed your stay at Family Tides in Seaside. We are looking forward to seeing you back in the future! Thank you again for your review." "This Seaside rental was perfect for our stay. It was a close safe bike ride to the Seaside Prom and all of that Seaside has to offer. It was also a wonderful break from the HOT weather in Portland. 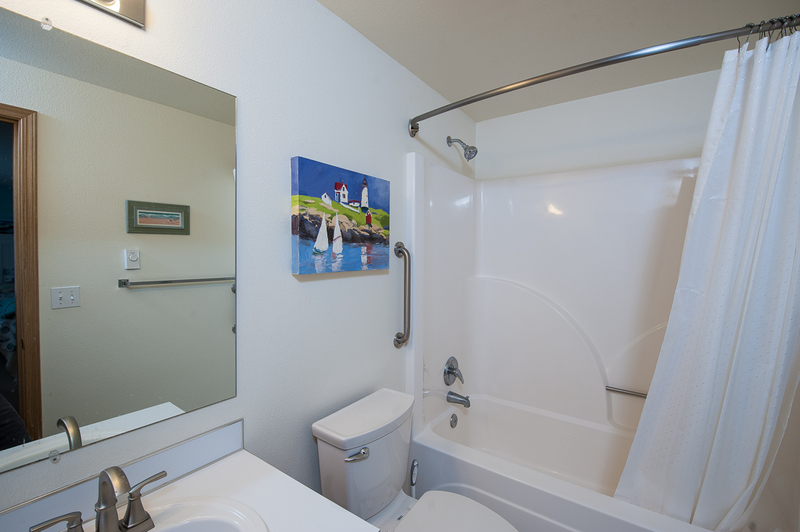 Our contact with Oregon Beach Vacations and the house we rented made our stay very easy and enjoyable." "Hello Richard, Thank you for your review. We are glad to see that you enjoyed your stay at Family Tides in Seaside. It sounds like this was a nice getaway from the hot weather. We hope to have you stay with us again in the future. Thank you again for your review." "Great Rental - Lots of Space, very Clean"
"Hello Ryan, Thank you for your review. We are glad to hear that you had a good time at Family Tides in Seaside! We hope to have you back again soon on the Oregon coast." "The house was even better than expected everything we didn't bring we seemed to find inside the house"
"Hello Michael, Thank you for your review. We are glad to hear that you had a good time visiting Family Tides in Seaside! We are glad the home had everything you needed to enjoy your stay. We hope to have you back again soon on the Oregon coast for another wonderful getaway!" "We were on quilting retreat and house was great for that. We loved it and there was lots of space and great lighting. Only complaint was that iron did not work and there was no ironing board. Probably doesn’t matter to most but critical for quilting. Also only left 3 dishwasher pods for 5 day rental and we had to do last 2 days by hand washing. Other than those minor things we loved the house and will be back next year. " "Hello Gwendolyn, Thank you for your review. We are glad to hear that you had a lovely stay at Family Tides in Seaside. We are sorry to hear that the iron was not working during your stay and that there was no ironing board. We would have happily brought new items out to the home had we been made aware of this issue, as well as brought more dishwasher pods. Thank you again for your review, and we are glad that the home was otherwise great for what you needed during your quilting retreat. We look forward to having you stay with us again next year!" "The home was very comfortable with a very well-equipped kitchen. There was a lot of room to hang out and enjoy the company the beach was very close." "Hello Michelle, Thank you for your review. We are glad to see that you enjoyed your stay at Family Tides in Seaside. We hope to see you back soon!" "We loved the home and will rent it again. Three separate bedrooms and two baths worked out very well." "Hello Patricia, Thank you for your review. We are glad to see that you enjoyed your stay at Family Tides in Seaside. We are excited to host you again soon on the Oregon coast!" "We came down for the weekend for a marriage retreat, booking and all the information for arrival is very easy. Very nice home exactly as described in photos, very close to beach and also to local restaurants. Very clean and welcoming. Will definitely book again!! " "Hello Erin, Thank you for your review. We are glad to hear that you enjoyed your stay at Family Tides in Seaside. We are happy that the rental was perfect for your needs during this marriage retreat. We look forward to having you stay with us again in the future!" Well stockked, spacious, comfortable, and clean! "This was the perfect spot for our Christmas escape! Close to the beach and river, very quiet, very clean, and had everything we needed! Super! Customer service was excellent when I called. " "Hello Elaine, Thank you for your review! We are so happy that you and your loved ones enjoyed your stay at Family Tides in Seaside! It's always wonderful to hear that our customer service is friendly, attentive and helpful! We hope that you'll be back soon for another Oregon coast vacation! Thank you again for your review!" "We loved every minute of our stay here. The house was super cozy, and a fantastic size for 3 women. Literally a 2 minute walk to the beach, and a short drive into town. I would absolutely stay here again! We hiked Tillamook Head one day, went zip lining the next, and just relaxed at the beach on our final morning. Found some amazing restaurants - for breakfast, The Osprey Café is to die for! The Seaside Brewery was also great - all had gluten free options for me to choose from. And you can't go to Seaside without checking out the Seaside Candyman...holy salt-water taffy!! A fabulous vacation, wish we could have stayed longer." "Hello Stefanie, Thank you for your review. We are pleased to see that you loved your stay at Family Tides in Seaside. We are glad you and your friends were able to get the most out of your visit to the Oregon coast. We hope to have you all back again soon for another fun getaway! Thank you again for your review." "So clean and well kept. " "Hello Katherine, Thank you for your review. We are glad to see that you enjoyed your stay at Family Tides in Seaside. We hope to have you back again soon on the Oregon coast for another wonderful vacation!" "Overall this was a wonderful house for our family of 6 including 2 small children. There was plenty of space, the beds were comfy, the house was fairly clean (carpet had several spots in the bedrooms but that didn't bother us) and they even had some toys and games that helped keep the children entertained while we were in the house. The kitchen was very well stocked and had just about anything you could need for preparing a meal there. The house is only a short walk from the beach and close to a mile from the main Boardwalk area. We drove down to the boardwalk area for some meals but you could probably easily walk down if you wanted to. The beach area was nice since it wasn't along the boardwalk area, it was less crowded. The only negative on the property was the house had a very strong pet odor even though pets are not allowed for renters. I have pet allergies so I needed to take some extra precautions. Other than that, I would recommend this home again." "Hello Ashley, Thank you for your review. We are glad to hear that you enjoyed your stay at Family Tides in Seaside. We are happy to hear that the home was mostly perfect for you during your stay. We are sorry that the carpets were somewhat dirty. This home has since been deep cleaned. We are also sorry to hear that it smelled of pets. We are not sure what the reason may be for this. The home may have once allowed pets or perhaps the owners have pets of their own. We are sorry for this inconvenience. We hope to have you stay with us again in the future. Thank you again for your review. " "Great home in s great location. Missing some essentials like garbage bags but that was minor short term inconvenience. Fit our needs perfectly." "Hello Richard, Thank you for your review. We are glad to hear that you enjoyed your stay at Family Tides in Seaside! We are sorry to hear that a few items were missing. We would have happily brought more out to you had we known about this issue. Thank you again for your review, and we hope to have you stay with us again soon!" "My family thoroughly enjoyed our stay in your home. It was very accommodating for all, and close to beach and all the things kids like to do at the beach. Would definitely come bank. Thank you." "Hello Vickie, Thank you for your review. We are happy to know that you enjoyed your stay at Family Tides in Seaside. We look forward to having you stay with us again in the future!" "I had hoped to hear back on a resolution from our concerns before I had to write this review, however, since OBV has not bothered to respond to our submitted concerns, I fear I will not be giving as a good of a review as I would've liked."